Meet Mystacina miocenalis, the earliest known species of Mystacina, and also the largest. At 40 grams, this bat was 3 times as heavy as its modern relatives. The fossil material of this animal was collected from Lake Manuherikia, which was once surrounded by rainforest around 17 million years ago. The size of this animal suggests that it was doing less in the air and more on the ground, preying on larger animals and eating larger fruits and seeds then its modern relatives. Flightless bats (albeit ones way larger then M. miocenalis) have been the subject of much speculation (i. e. Dixon’s “Night Stalker”, Primeaval’s “Future Predator” , etc. ), so the presence of a possible ground-based bat in the fossil record seems to be less of a surprise. Turtles (or at least their ancestors) are in the news too! 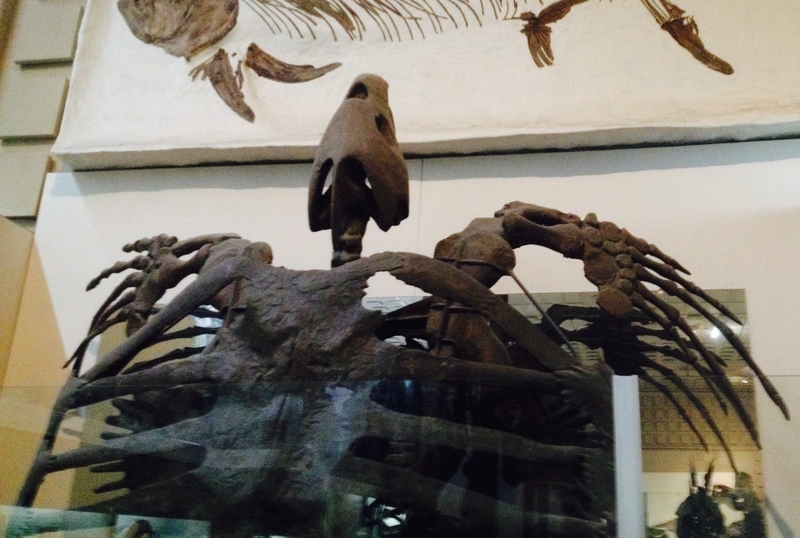 The newly-described Pappochelys sheds light on how the turtle shell evolved. In this animal’s case, rod-like bones, some of which fused to each other, coated the underbelly. 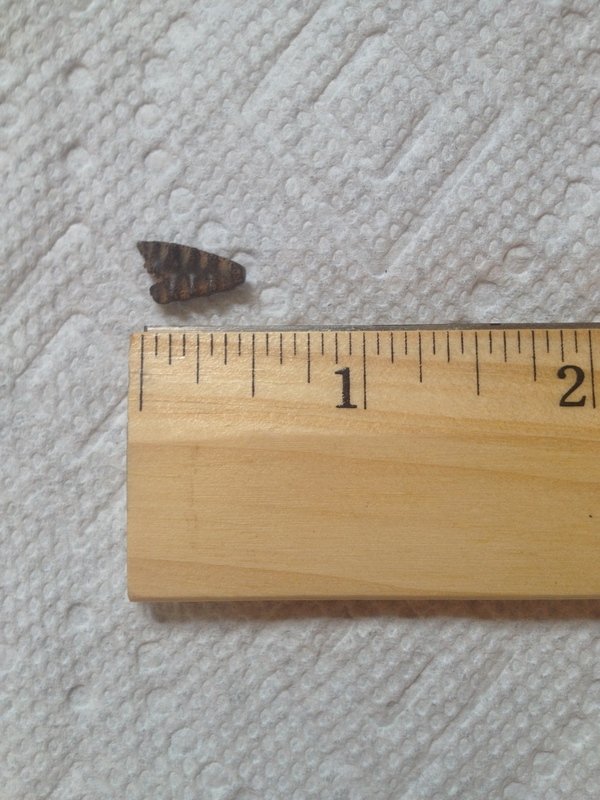 In life, the animal was around 8 inches long. The animal lived in a tropical lacustrine environment. Archelon, a giant protostegid turtle from the Late Cretaceous of North America, evolved from a small, lizard-like animal similar to Pappochelys. Photo by the author, 2014. There’s a new prosauropodomorph in town, and its name is Sefapanosaurus. At one point this dinosaur was mistaken for Aardonyx , but Otero et. al. (2015) has concluded that the holotype of Sefapanosaurus is a new species. The animal was collected from the Elliot Formation of Southern Africa many years ago, and, although the specimen is far from complete, the presence of this dinosaur furthers our understanding of Upper Triassic and Lower Jurassic ecosystems. Prosauropodomorphs, like this Plateosaurus at the AMNH, were very successful during the Late Triassic but started to decline by the earliest Jurassic. Photo by the author, 2015. Jaime Headden discusses the new classification of Balaur blondoc as a basal avalian. 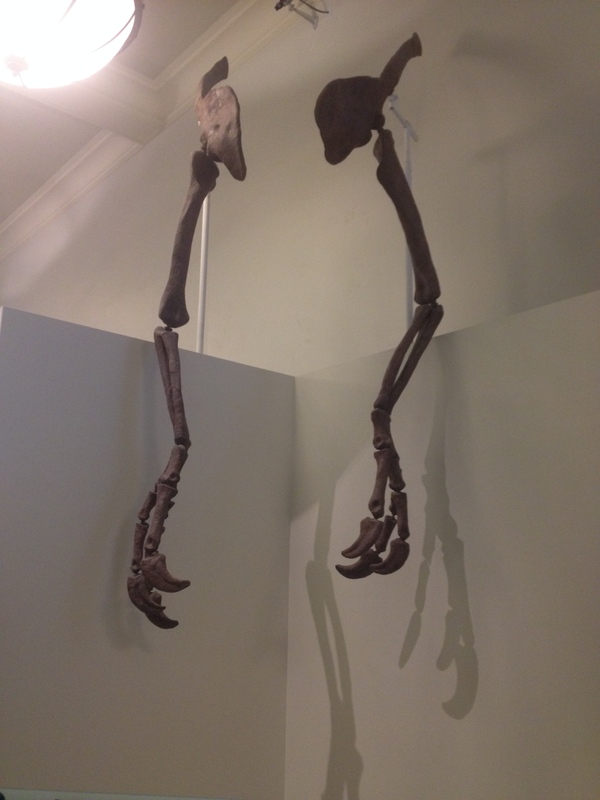 Jaime has also created a skeletal of the animal based on this new placement, which he has included in his new article on Balaur. You can find that article here. Heinrich Mallison brings us an update on his digiS project. Photogrammetry is pretty cool, indeed! Check out his post here. At Letters from Gondwana, the life and times of part-time paleobotanist and dedicated feminist Marie Stopes. She challenged the societal norms of her time, and her story is one that should be remembered. You can go check out that post here. Mark Witton discusses speculative behaviors and events pertaining to dromaeosaurs. He also showcases some of his beautiful artwork. You can find that post here. 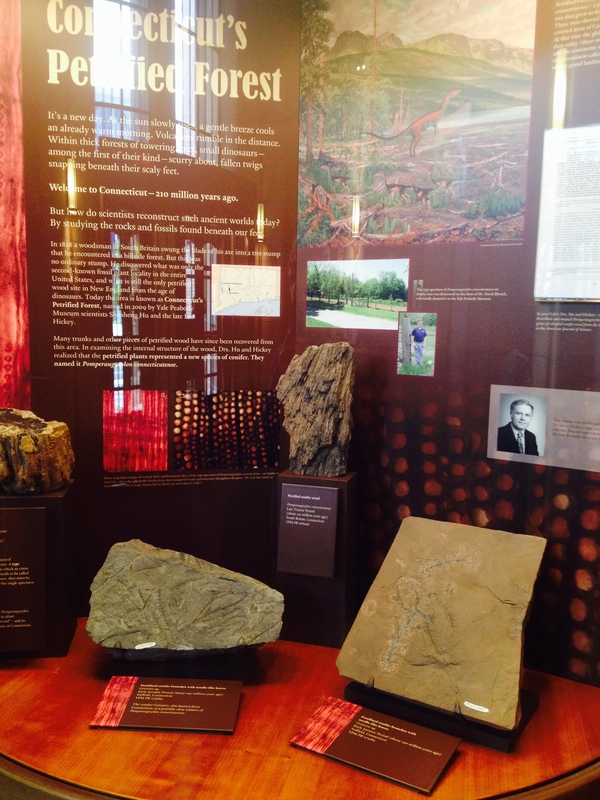 This week we have my photo of the Connecticut’s Petrified Forest display at the Yale Peabody Museum. These fossils come from the middle of the state, usually somewhere in the vicinity of South Britain. It’s quite surprising to see how well-preserved these fossil plants are! Thanks for reading, and I hope you enjoyed! The coastal seas surrounding Appalachia left behind some of the best preserved fossil specimens in all of the East Coast. One state in particular is famous for its Cretaceous Marine fossils: New Jersey. Every year, private collectors and museum paleontologists alike flock to New Jersey to uncover ancient bones left behind by creatures which lived around 70 million years ago. One of the most famous site is Ramanessin Brook, where not only Cretaceous marine fossils but also Pleistocene fossils can be found. 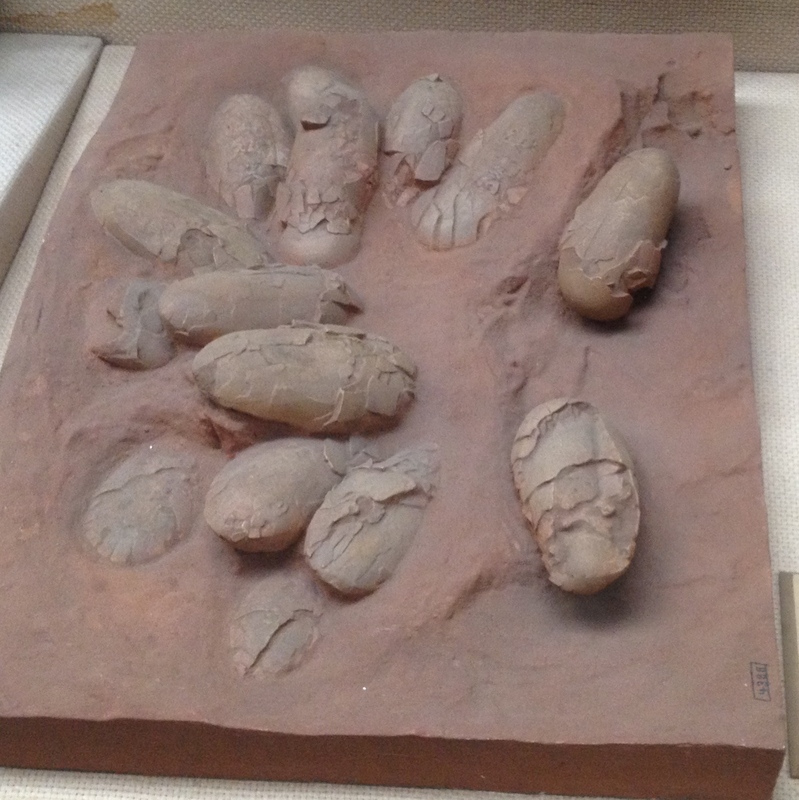 Commonly, fossils from the Navesink and Wenonah/ Mt. Laurel Formations are found in the brook, providing a glimpse into the ancient past of New Jersey. Fossils dating from the Pleistocene Ice Age are also found in the brook, giving this site a bit of variation in its fossil contents. Ramanessin Brook is known for one thing in particular: shark teeth. 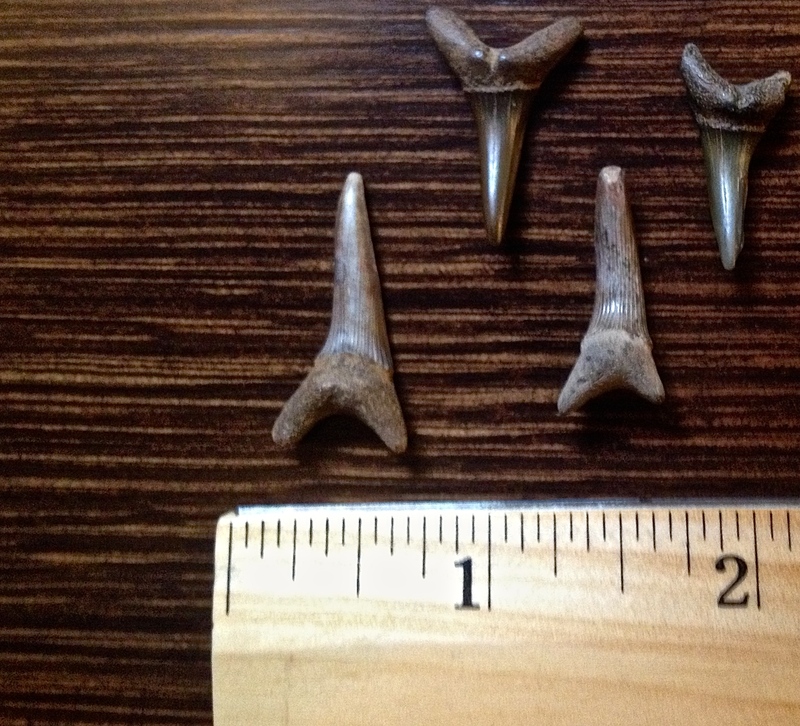 Exquisitely preserved shark teeth are a dime-a-dozen when it comes to this place. Although seemingly nothing compared to localities in the west, sites like Ramanessin brook offer us a lot of information on the ancient sea life of the Western Atlantic Ocean. Check out these pretty chompers! Scapanorhynchus texanus teeth collected Ramanessin Brook, NJ. Photo by the author, 2015. An ammonite carapace collected at Ramanessin Brook. Note that this is a sliver of the whole shell of the ammonite. This carapace fragment most likely belongs to Placenticeras sp. (meeki? ), but might also be that of a Sphenodiscus sp. Photo by the author, 2015. 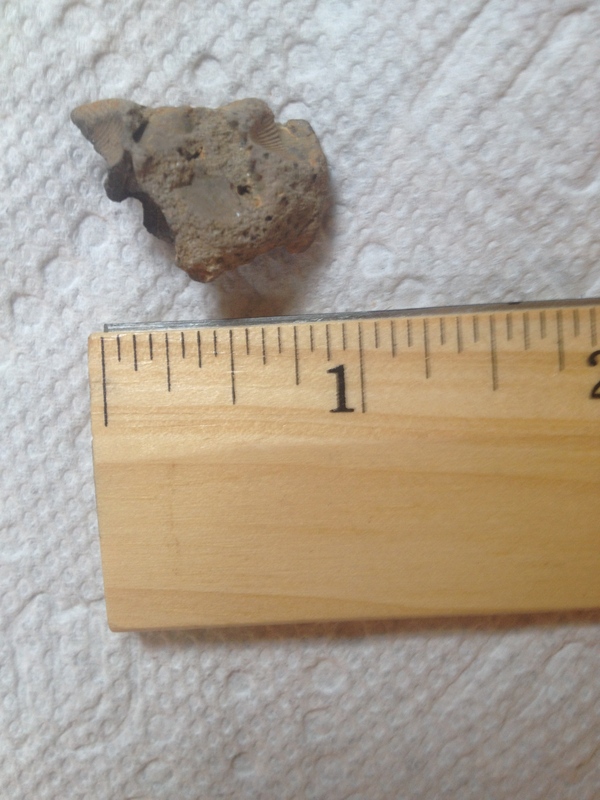 Here is a piece of matrix with some miscellaneous shell fragments and shell imprints. Boy was this tricky to prep! Photo by the author, 2015. Vertebrate body fossils are even more common then those of invertebrates at Ramanessin Brook. By far the most common are shark teeth. 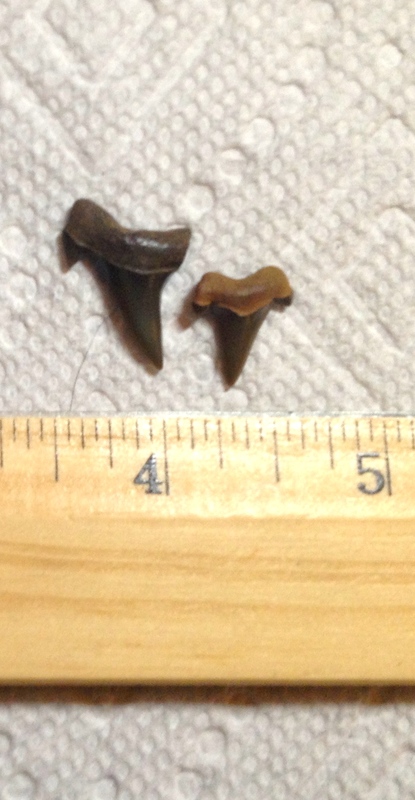 During this trip, shark teeth from at least 5 different species of shark were collected. Common teeth include those of Archaeolamna kopingensis kopingensis , Squalicorax kaupi, and Scapanorhynchus texanus. What’s especially interesting is that S. texanus, unlike its modern relative, lived in coastal waters. S. texanus is also the largest known species of Scapanorhynchus. Scapanorhynchus texanus lateral tooth. Photo by the author, 2015. Porbeagle sharks are represented by a couple genera, namely Archaeolamna kopingensis kopingensis and Cretodus borodini. These were both mid-sized sharks, with A. kopingensis kopingensis reaching 10 feet in length and C. borodini peaking at 7 feet from snout to tail. Archaeolamna kopingensis kopingensis teeth. Photo by the author, 2015. The largest sharks in these waters were Squalicorax pristodontus. 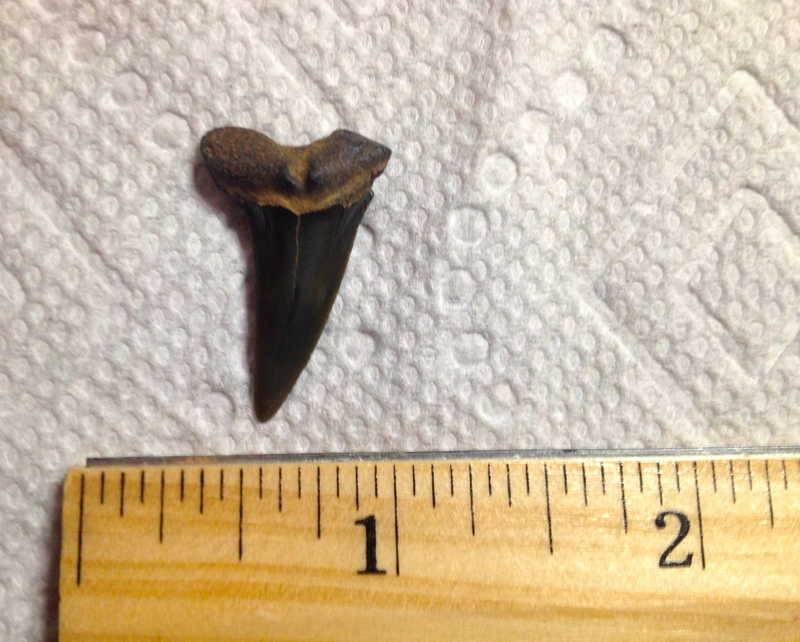 Only one tooth of this shark was found during my trip. These guys could reach up to 20 feet in length. Even these sharks, however, weren’t the largest predators in the sea, with large mosasaurs like Mosasaurus and Prognathodon also calling the west Atlantic home (Gallagher, 2005). The ecosystem the Navesink and Mt. Laurel/ Wenonah Formations represent is a coastal sea. As evidenced by the shark teeth above, there was a high diversity of sharks in the Western Atlantic during the Late Campanian/ Early Maastrichtian. The sun distorts the woodland, drying the earth and leaving the trees with a pale, greedy countenance. It’s migration season, and the hadrosaur herd marches across the parched landscape with the might of an army. The animals themselves are primarily Hadrosaurus, which bellow to ward off unwanted attention. Then there are the nodosaurs. Nodosaurs aren’t doing very well on Laramidia during the Campanian Stage of the Late Cretaceous, but on Appalachia they thrive. Armed to the eyelids with spikes and scutes, they pose quite a challenge for predators. Lophorhothon, another type of hadrosaur, are also found within the herd, but these animals are few and far between. None of these dinosaurs, however, is as impressive as Hypsibema crassicauda. The larger of the two species of Hypsibema, H. crassicauda can attain lengths of around 50 feet, making them some of the largest hadrosaurs and the biggest dinosaurs on Appalachia. One of the most massive individuals in the herd is a fourteen year old female who measures 45 feet from beak to tail. Alongside her is another female, slightly smaller at 42 feet in length. They triumphantly lead the herd of dinosaurs across the plain, pridefully stomping across the cracked earth below. The continent of Appalachia, however, is a very dangerous place for a herbivore, and much trouble awaits the herd. To reach a new browsing location, the herd must first cross a thin strip of beach. But there’s death in the water. The lone carcass of a Claosaurus drifts among the waves, alarming the already-weary herd. They know, however, that they must march on, and they forget about the rotting body. A few hours pass, and the herd is almost to the forest. Suddenly, a giant Deinosuchus rugosus rushes out of the water, catching a subadult Hadrosaurus between its jaws. Another Hadrosaurus, startled at the sight of the crocodile, bellows to alarm the rest of the herd. A larger individual bellows back, trying to scare away the Deinosuchus, which pulls the juvenile hadrosaur down into the abyss. The Hypsibema are also on guard, but for a different reason. They’ve spotted a lone male Dryptosaurus, and, although he poses little threat, they are weary of him, grunting and snorting to scare the tyrannosaur away. Undaunted, the Dryptosaurus goes about on his patrol, leaving the hadrosauroid giants to browse on the vast expanses of spruce and redwood trees which make up the forest behind them. Hypsibema crassicauda is one of the largest known hadrosaurs. At an estimated 49.2 feet in length (Holtz and Rey, 2007), this member of the Hadrosauroidea (Horner et. al., 2004) was most likely the largest herbivore in its ecosystem. The holotype, a fragmentary specimen discovered at the King James marl pits in North Carolina, consists of a caudal vertebra, a humerus, a tibia and a metatarsal (Cope, 1869). The material belongs to a huge hadrosaur. When we look at this Smithsonian specimen of a caudal vertebra of the animal (which is slightly smaller then the caudal vertebra included in the holotype), we find the bone’s length is approximately 10 centimeters. If we compare the bone with a large Edmontosaurus annectens caudal centrum (sadly in private hands), we realize that the Hypsibema crassicauda caudal centrum is approximately 25% larger. Knowing that large E. annectens could reach around 11.9 meters (Sues, 1997), we can estimate the size of H. crassicauda. We end up with 14.875 meters, or 48.8025 feet. Based on the estimated weight of related animals, I also estimate H. crassicauda to have weighed around 17-20 tons. That’s one large hadrosaur! Nevertheless, as Hypsibema crassicauda was a non-hadrosaurid hadrosauroid or basal hadrosaurid and E. annectens was a derived saurolophine, scaling the former from the latter is certainly a flawed approach. Holtz and Rey (2007) found H. crassicauda to be around 50 feet long and 14 tons. If Hypsibema crassicauda did attain this size, it wasn’t just a large hadrosaur, but one of the largest. I only know of two other non-dubious hadrosauroids estimated at longer then 49.2 feet in length and greater than 14 tons in weight: Shantungosaurus giganteus at an estimated 54 feet (Zhao et. al., 2007)(if Ji et. al., 2011 were right that Zuchengosaurus maximus is a junior synonym of S. giganteus) and 18 tons (Horner et. al., 2004) and Magnapaulia laticaudus at between 49.2 and 54.1 feet and with a weight of up to 25 tons (Morris, 1981). A more recent study, however, has estimated the latter dinosaur to be around 41 feet in length (Prieto-Márquez et. al., 2012). If Prieto-Márquez et. al. (2012) are correct in their size estimate of Magnapaulia, Hypsibema may be the longest known North American hadrosauroid and rivals Shantungosaurus giganteus as the biggest ornithischian known to science. Like other hadrosaurids, H. crassicauda was designed to be an efficient eater. It has even been suggested that hadrosauroids could browse for food sources up to 4 meters above the ground (Mallon & Anderson, 2013). This would make sense for a giant hadrosauroid such as Hypsibema crassicauda, the body of which would require an ample daily food supply. I imagine H. crassicauda as the elephant of Appalachia, browsing on anything it could get its beak around. The habitat of this dinosaur would have been woodland, where it would have had a food supply to match its appetite. The habitat of Hypsibema crassicauda may have been similar to this. 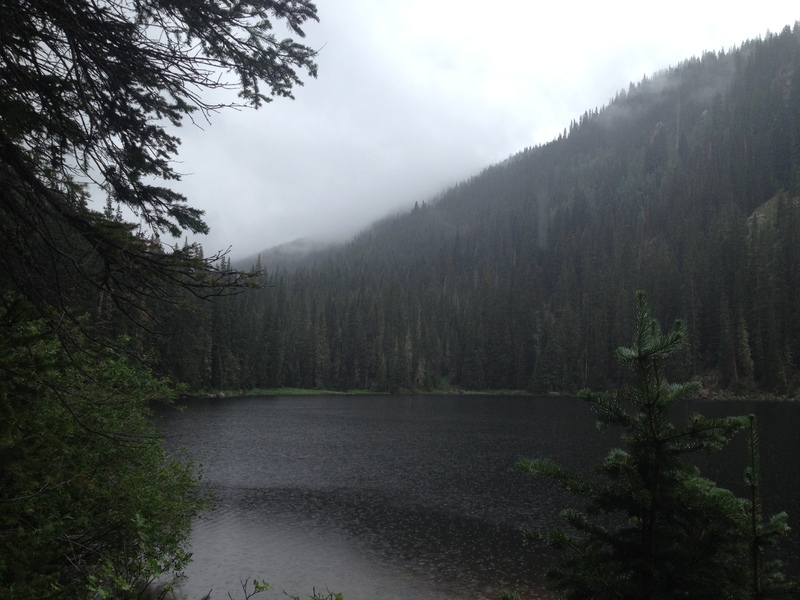 Beaver Lake, Colorado. Photo by the author, 2015. The size of Hypsibema crassicauda also interests me for another reason. Along with Hypsibema crassicauda, two other species of gigantic basal hadrosaurid are known from the eastern United States. These are the gigantic Hypsibema (=Parrosaurus) missouriensis from Missouri (estimated at around 50 feet and 14 tons as well (Holtz and Rey, 2007)(although this animal seems to be smaller then H. crassicauda) and Ornithotarsus immanis from New Jersey, a possible synonym for Hadrosaurus foulkii (Prieto-Marquez et al., 2006) (which is estimated to be 39.6 feet in length and 7 tons in weight (Holtz, 2012)). The location of these animals (did I mention Hypsibema crassicauda material is reported to have been found in NJ?) shows that gigantic hadrosaurids in the 40-50 foot, 10-20 ton size range were very widespread across Appalachia during the Late Cretaceous, whereas on Laramidia, only one hadrosauroid taxon has been estimated to be that gigantic (the lambeosaurine Magnapaulia laticaudus, see above). Even these lambeosaurine giants had competition! The morphological similarities of lambeosaurine and ceratopsid dinosaurs might have been the reason that they weren’t able to coexist for long periods of time due to competitive exclusion (Mallon & Anderson, 2013). So why were there so many gigantic hadrosauroids on Appalachia? I believe the evolution of gigantism in these animals may have to do with the lack of ceratopsids and highly derived hadrosaurids in eastern North America during the time. Ceratopsids were most likely low-level browsers, using their strong beaks to ingest tough plant matter (Mallon & Anderson, 2013), and lambeosaurines probably occupied similar regions of ecomorphospace (Mallon & Anderson, 2013). The possible scarcity of these groups on Appalachia (so far, we haven’t found any ceratopsian remains on the East Coast, and lambeosaurine remains, though present (Gallagher, 2002), are seldom found and only reported from Maastrichtian deposits) might have allowed more basal forms to thrive. The skull of Triceratops, a derived chasmosaurine ceratopsid. Photo by the author, 2014. So what about Saurolophinae? You said derived hadrosaurids earlier, not just lambeosaurines. A couple of possible saurolophine dinosaurs are known from Appalachia. I have heard that the Alabama taxon Lophorhothon atopus is to be a saurolophine by some (a juvenile Prosaurolophus in particular). More recent analyses have concluded that L. atopus is a basal hadrosauroid (Prieto-Marquez & Salinas, 2010). 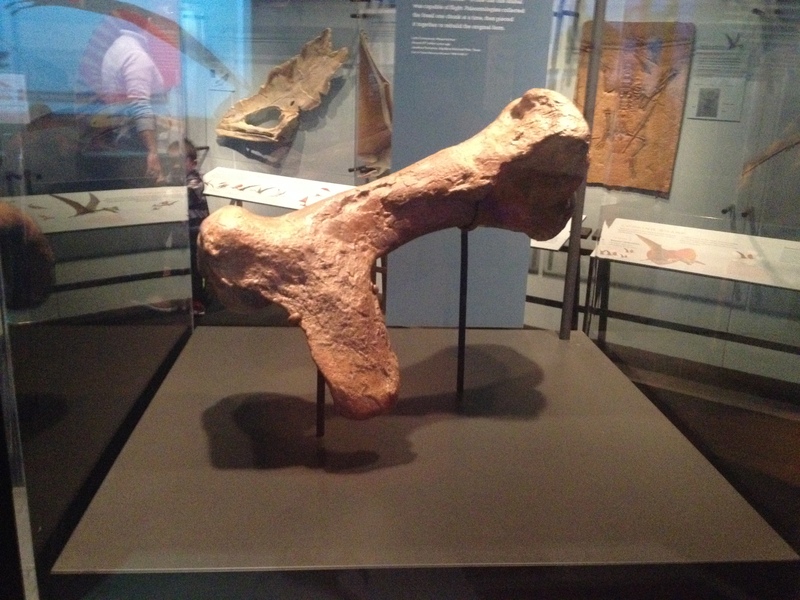 Although some have suggested the presence of Edmontosaurus sp. at the Ellisdale site (Gallagher, 1993), a Marshalltown Formation exposure that is around 72 million years old, this dinosaur’s presence in New Jersey is tentative at best, and the reported “Edmontosaurus sp.” remains are probably better considered to be from Hadrosaurus or an indeterminate hadrosaur. 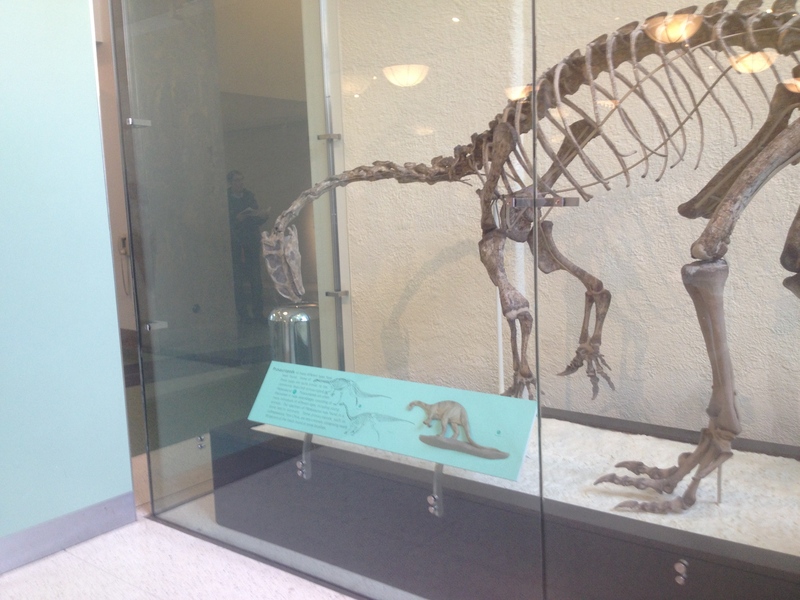 The skeleton of an Edmontosaurus, a saurolophine dinosaur, at the Yale Peabody Museum. Note the featherless Deinonychus photobombing. Photo by the author, 2014. Another question might be about competitive exclusion between east coast nodosaurs and giant hadrosaurids. Mallon & Anderson (2013) also covers this for us. Their analysis concluded that ankylosaurs were the least likely to compete with other large herbivores. If the lack of ceratopsids and derived hadrosaurs is what allowed the large basal hadrosaurids of the East Coast to thrive, then the presence of these groups might have also caused the downfall of hadrosaurian giants like Hypsibema crassicauda. The Navesink Formation, a Maastrichtian-age deposit, bears both the remains of (possible) lambeosaurines (Gallagher, 2002) and smaller, basal hadrosaurids, such as Hadrosaurus (Gallagher et. al., 1986), found on Appalachia prior to the closing of the Western Interior Seaway (AMNH 7626, attributed to Hadrosaurus, from the Campanian, for example). It seems to me that the immigration of west-originating dinosaur groups to the eastern US is correlated with the disappearance of large basal hadrosaurids on Appalachia. The giant basal hadrosaurids of Appalachia may have simply been out-competed. If lambeosaurines were indeed migrating to the eastern US, it might also have been the case that native eastern US forms headed westward. The end result would be the odd giant basal hadrosaur in a western Maastrichtian deposit, like Hell Creek. Others have also speculated about the presence of these animals in the west. These must have been very rare occurrences, though, as I do not know of any dryptosaur and/or giant basal hadrosaurid remains reported from Hell Creek or any other western Maastrichtian deposits. If ACDs (Alien Coast Dinosaurs is what I will call these migrants from now on) existed in both the west and the east, we would be looking at a cross-continental dinosaur migration occurring in the time range of 2-3 million years. I will talk more about this concept in later installments of Antediluvian Beasts, so for now, keep this idea in mind. Many other types of animals uncommon or absent in the west coexisted with Hypsibema crassicauda. On Appalachia, the dryptosaurs were among the top terrestrial predators, whereas in the west, derived tyrannosaurids ruled the roost. We know H. crassicauda existed alongside dryptosaurs due to the presence of H. crassicauda at Ellisdale (Grandstaff et. al., 1992) alongside Dryptosaurus sp. (Grandstaff et. al.,1992). It’s possible that the gargantuan hadrosaur might have even fallen prey to the dryptosaurs present in its environment. So what were the dynamics of Hypsibema crassicauda’s environment, exactly? In the southern part of H. crassicauda’s known range, it would have co-existed with other hadrosaurs, such as “Hadrosaurus minor” (Lull & Wright, 1942), and theropods such as “Ornithomimus“ antiquus (Baird & Horner, 1979). At Ellisdale, the gigantic hadrosauroid would have shared the woodland with Hadrosaurus (Grandstaff et. al, 1992), “Ornithomimus” (=Coelosaurus)(Denton & Gallagher, 1989), and the predatory theropod Dryptosaurus (Grandstaff et. al., 1992). The variation of sizes among the hadrosaurs present in the environments mentioned above (Hypsibema crassicauda grew to 48.8 feet in length, whereas a Hadrosaurus reached 26 feet in length (Holtz, 2012)) suggests that niche partitioning might have evolved between these dinosaur genera. 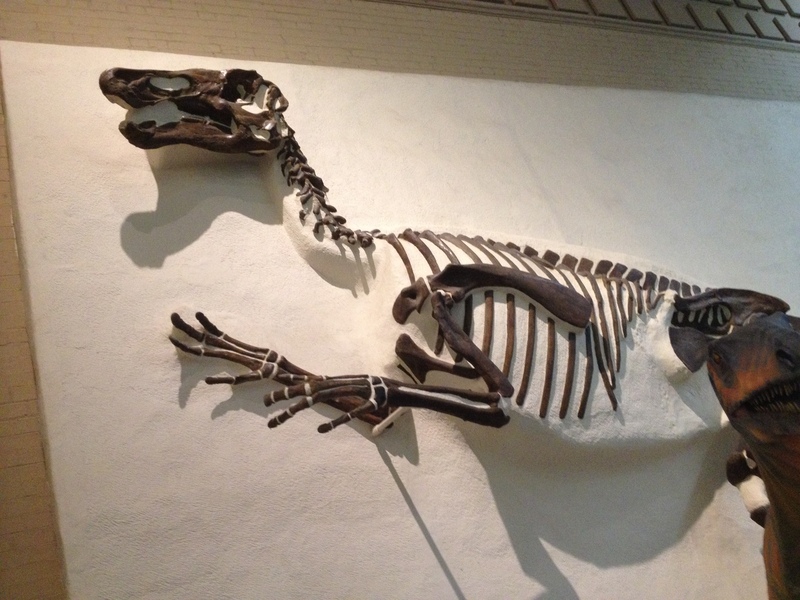 Hadrosaurus could have been the low-browsing deer to Hypsibema’s variety-browsing elephant. So many hadrosaur species of varying sizes from the Late Campanian and Early Maastrichtian of the East Coast are known (i.e. Hadrosaurus foulkii, Hadrosaurus cavatus, Ornithotarsus immanis, Hadrosaurus minor, etc.) that it is hard to imagine the absence of niche partitioning among these dinosaurs. Hypsibema crassicauda‘s kind would survive until the end of the Cretaceous, with forms like Hadrosaurus minor surviving into the Maastrichtian and their remains deposited in the Navesink Formation (Gallagher et. al., 1986). The giant hadrosauroids, however, would decrease in number, being replaced by the lambeosaurines and saurolophines which arrived from the west as the Western Interior Seaway had closed. The KT extinction event finally sealed the giant hadrosaurs’ fate, their bones left to dry in the hot, cracking dirt. 1. Holtz, T. R. Jr.; Rey, L. V. .2007. Dinosaurs: The Most Complete, Up-to-Date Encyclopedia for Dinosaur Lovers of All Ages. New York: Random House. p. 409. 2. Horner, J. R.; Weishampel, D. B.; Forster, C. A. .2004. “Hadrosauridae”. In Weishampel, David B.; Dodson, Peter; and Osmólska, Halszka (eds.). The Dinosauria(2nd ed.). Berkeley: University of California Press. pp. 438–463. 3. Cope, E. D. .1869. “Remarks on Eschrichtius polyporus, Hypsibema crassicauda, Hadrosaurus tripos, and Polydectes biturgidus.” Proceedings of the Academy of Natural Sciences of Philadelphia 21: 191-192. 4. “Hypsibema crassicauda” Collections Search Center, Smithsonian Institution. Smithsonian Institution. URL: http://collections.si.edu/search/results.htm?q=Hypsibema+crassicauda . Accessed June 10, 2015. 5. Sues, H-D. (1997). “Ornithopods”. In Farlow, James O., and Brett-Surman, Michael K. (eds.). The Complete Dinosaur. Bloomington: Indiana University Press. p. 338. 6. Zhao, X.; Li, D.; Han, G.; Hao, H.; Liu, F.; Li, L.; Fang, X. .2007. “Zhuchengosaurus maximus from Shandong Province.” Acta Geoscientia Sinica 28 (2): 111–122. 7. Ji, Y., Wang, X., Liu, Y., and Ji, Q. .2011. “Systematics, behavior and living environment of Shantungosaurus giganteus (Dinosauria: Hadrosauridae).” Acta Geologica Sinica 85(1): 58-65. 8. Morris, W. J. .1981. “A new species of hadrosaurian dinosaur from the Upper Cretaceous of Baja California: ?Lambeosaurus laticaudus.” Journal of Paleontology 55(2): 453–462. 9. Prieto-Márquez, A.; Chiappe, L. M.; Joshi, S. H. .2012. Dodson, Peter, ed. “The lambeosaurine dinosaur Magnapaulia laticaudus from the Late Cretaceous of Baja California, Northwestern Mexico.” PLoS ONE 7 (6): e38207. 10. Mallon, J. C.; Anderson, J. S. .2013. 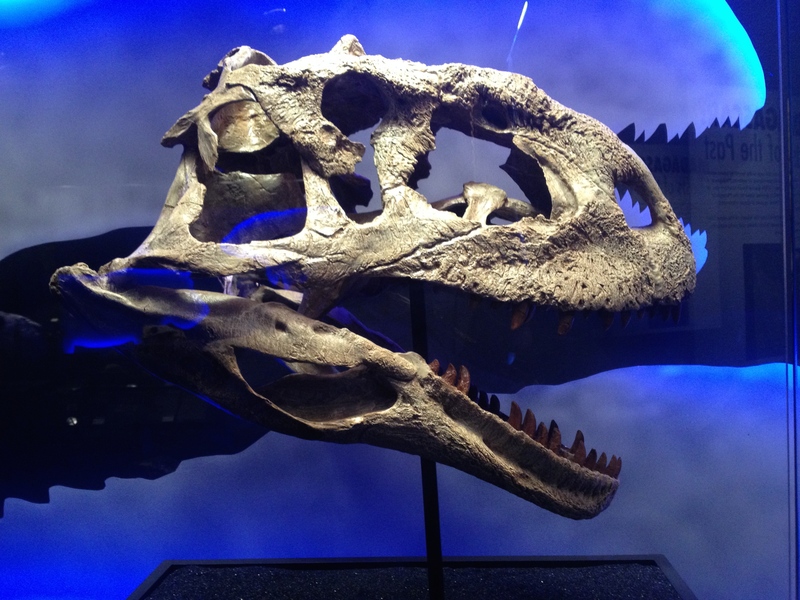 “Skull Ecomorphology of Megaherbivorous Dinosaurs from the Dinosaur Park Formation (Upper Campanian) of Alberta, Canada.” PLoS ONE 8(7): e67182. 11. Prieto-Marquez, A.; Weishampel, D. B.; Horner, J. R. .2006. “The dinosaur Hadrosaurus foulkii, from the Campanian of the East Coast of North America, with a reevaluation of the genus.” Acta Palaeontologica Polonica 51: 77-98. 12. Holtz, T. R. Jr; Rey, L. V. .2007. Dinosaurs: the most complete, up-to-date encyclopedia for dinosaur lovers of all ages. New York: Random House. (Updated during 2012) link: PDF . 13. Gallagher, W. B. .2002. “Faunal changes across the Cretaceous-Tertiary (K-T) boundary in the Atlantic coastal plain of New Jersey: restructuring the marine community after the K-T mass-extinction event.” Catastrophic Events and Mass Extinctions: Impacts and beyond. GSA Special Paper 356:291-301. 14. Prieto-Marquez, A.; Salinas, G. C. .2010. “A re-evaluation of Secernosaurus koerneri and Kritosaurus australis (Dinosauria, Hadrosauridae) from the Late Cretaceous of Argentina.” Journal of Vertebrate Paleontology 30(3): 813-837. 15. Gallagher, W. B. .1993. “The Cretaceous/Tertiary mass extinction event in the North Atlantic coastal plain.” The Mosasaur 5:75-154. 16. Grandstaff, B. S.; Parris, D. C.; Denton, R. K. Jr.; Gallagher, W. B. .1992. “Alphadon (Marsupialia) and Multituberculata (Allotheria) in the Cretaceous of Eastern North America.” Journal of Vertebrate Paleontology 12(2): 217-222. 18. Lull, S; Wright, N. E. .1942. “Hadrosaurian dinosaurs of North America.” Geological Society of America Special Paper 40:1-242. 19. Baird, D.; Horner, J. R. .1979. “Cretaceous dinosaurs of North Carolina.” Brimleyana 2:1-28. 20. Denton, R. K.; Gallagher, W. .1989. “Dinosaurs of the Ellisdale site, Late Cretaceous (Campanian) of New Jersey.” Journal of Vertebrate Paleontology 9(3, suppl.):18A. 21. Gallagher, W. B.; Parris, D. C.; Spamer, E. E. .1986. “Paleontology, biostratigraphy, and depositional environments of the Cretaceous-Tertiary transition in the New Jersey coastal plain.” The Mosasaur 3:1-35. EDIT: The remains of a leptoceratopsid have been reported from the Tar Heel Formation of Cretaceous North Carolina. This shows that ceratopsians were present on Appalachia. However, the presence of leptoceratopsids on Appalachia does not automatically imply that the generally larger ceratopsids were present as well. For starters, this is the nicest review I could come up with. I hated the sexism and cheesy acting in the movie, and I was actually rooting for the monsters and not the humans. Running in high heels? Really? I will restrain my anger for now, though. I had the opportunity to see World with a couple of good friends. Although the movie has really inaccurate depictions of dinosaurs, it isn’t (hopefully) supposed to be factual. The movie really ends up being about respect for the natural world. Indominus rex was created in order for the park to reap in cash, and is treated by many of the characters as just an “asset.” The animal escapes its cage, killing anything it can get its hands on. During this process, the Jurassic World staff learn that the genetically modified animals they call dinosaurs are living, breathing animals, and not just money-making attractions. Indominus rex is the manifestation of the greed of humanity, a theme common in all of the Jurassic Park movies. Even though World isn’t factual, it definitely hits upon some important issues coming up in modern society. World isn’t meant to be an all-around-science-based movie, – Jurassic Park wasn’t either – but it is good that we paleontologists and paleo-enthusiasts point out its inaccuracies. Many outside our field, I’m afraid, most likely does not understand the magnitude by which the JW monsters differ from their real counterparts. Some people are just hooked onto the Jurassic Park portrayals of dinosaurs, arguing against actual scientists in order to keep images of scaly, hand-pronating dinosaurs around. Jurassic World, though not meant to be a science-based film, would be greatly improved with accurate depictions of dinosaurs, surprising us just as the original surprised with the most up-to-date dinosaurs on the big screen in 1993. Hello everyone! This is PaleoNews, where I showcase the latest in paleontological discoveries! A new horned dinosaur showing signs of convergent evolution has been described! Regaliceratops was a large ceratopsian, up to 6 meters long, which was closely related to Triceratops, and shows features found in chasmosaurines as well as centrosaurines. This is strikingly odd, as the animal itself was a chasmosaurine. The centrosaurine features found present in Regaliceratops might be convergent evolution among the ornaments of horned dinosaurs. Regaliceratops itself is known from a mostly complete skull, which bears an impressive nose horn, two minuscule orbital horns, and large, stegosaur-plate-shaped epoccipitals. The genus name Regaliceratops pays homage to these large epoccipitals, translating to “Royal horned face”. The animal was excavated from the St. Mary River Formation, a Maastrichtian deposit. Other ceratopsids also are found in this formation, as well as the large tyrannosaurid Albertosaurus. New vertebral centra reveal that giant Cretaceous sharks might have been more common then expected. Leptostyrax macrorhiza is the Cretaceous shark these remains are thought to represent, and if so, Leptostyrax might have attained a length of up to 20 feet. This finding is important as it adds to our understanding of Early Cretaceous marine environments. A new species of reptile has been described. Clevosaurus sectumsemper is an extinct sphenodont from the Triassic period. As always, animals like this new taxon show the ancient diversity of a now unspeciose group of animals. A new enantiornithine bird from Gondwana has been discovered. This small avian dinosaur lived around 115 million years ago and is a rare discovery in a land filled with the bones of giant saurischians. The bird is as of yet not described, but, as always, I’d rather the authors do a good job with the description then put out a rushed paper. Soft tissue from dinosaur bones has been discovered. An examination of fragmentary dinosaur remains resulted in the identification of structures interpreted as preserved tissues. On his blog, Mark Witton discusses Dimorphodon’s awesomeness. It’s quite an interesting post, which you can view here. At SV-POW!, Mike discusses the reasons we might never find the largest dinosaurs. He brings up some very good points, and I definitely recommend you check it out here. 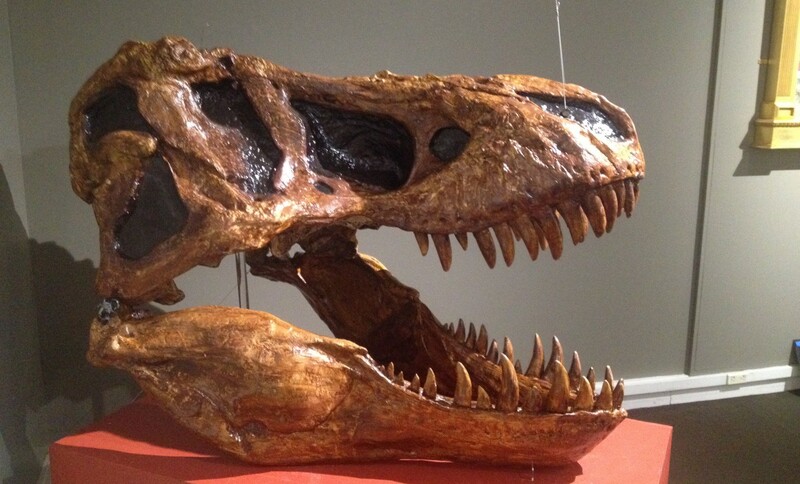 Also check out this great post on Haestasaurus. 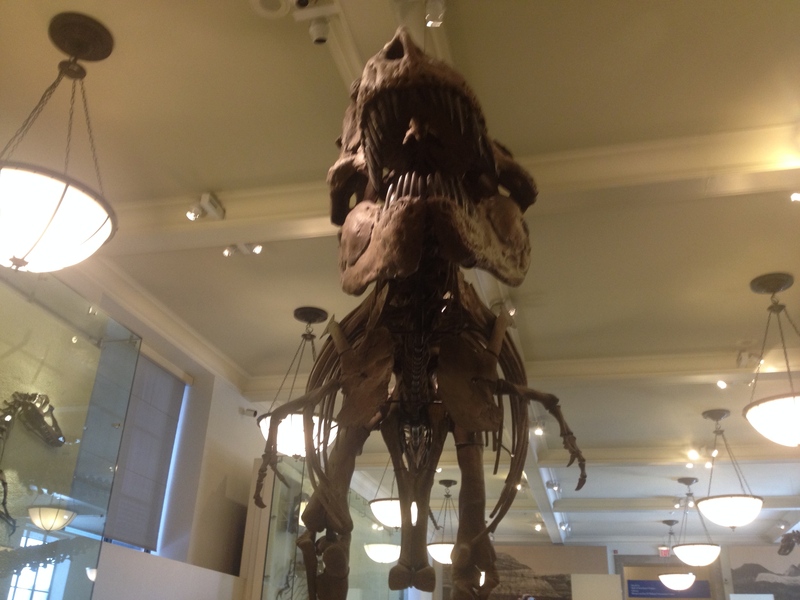 At Extinct Monsters, Ben discusses the history of three very iconic tyrannosaurs, some of which are now hidden behind the Tyrannosaurus rex on display at the American Museum. The post can be viewed here. Twilight Beasts discusses camels, camels, and more camels. You can go over here to read the post. Photo by the author, 2015. I hope you enjoyed PaleoNews #14. Thanks as always for reading!